Registration is now open for the Seventh Euricse Workshop on Co-operative Finance and Sustainable Development (DEADLINE 14th JUNE). 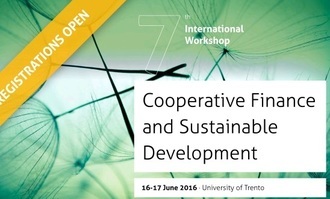 The workshop, organized in collaboration with Federcasse (Italian Federation of Cooperative Credit Banks) and with the support of EACB (European Association of Co-operative Banks), will be held in Trento, Italy on June 16th and 17th, 2016. For any further information (registration, call for papers, etc), please click HERE.